"Be a responsible ancestor. In the end, that is your only job in life." 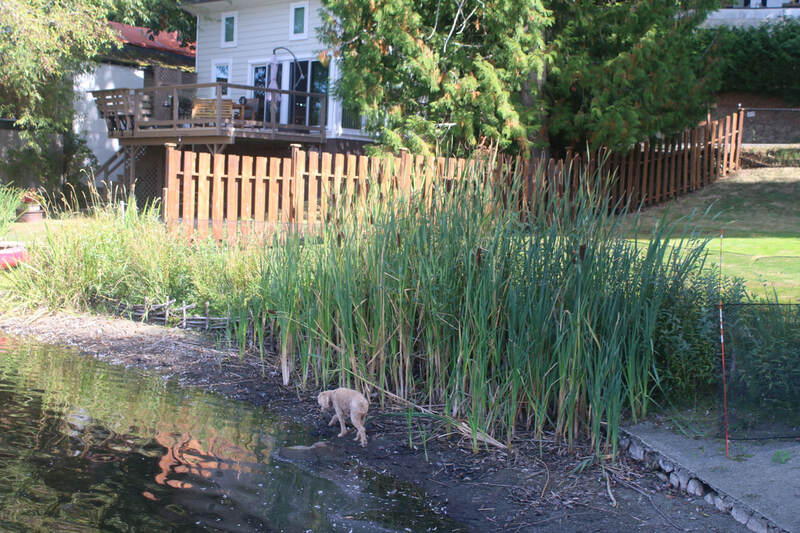 The Shawnigan Basin Society is now in a position to move forward with specific foreshore restoration projects and encourages lakeshore property owners to consider their properties for ecological restoration. Using bioengineering techniques such as the removal of riprap or cement retaining walls and replacing them with wattle walls and strategically placed live stalks – mimicking nature’s design - foreshore erosion caused by wave energy is effectively absorbed and disbursed, biodiversity of plants is increased, and aquatic habitat is enhanced. Ecological Restoration Project 1 "Before". Ecological Restoration Project 1 "After". 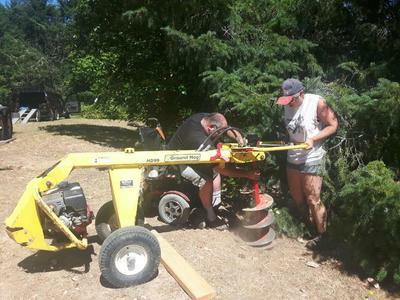 ... an environmentally friendly wattle wall! 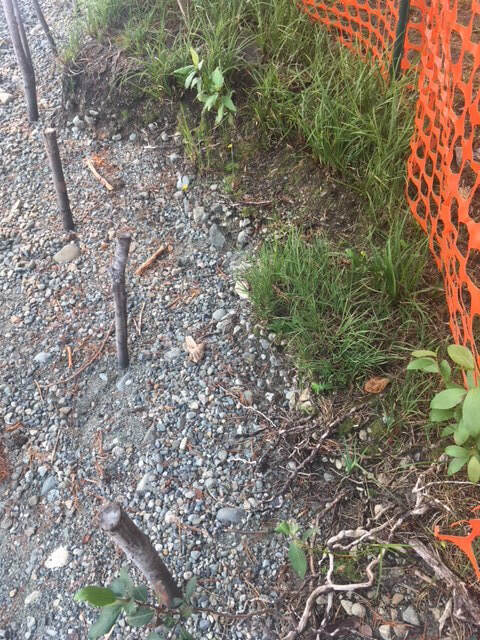 One year later - growth establishing at the foreshore with root systems building superior strength in lieu of a cement barrier. 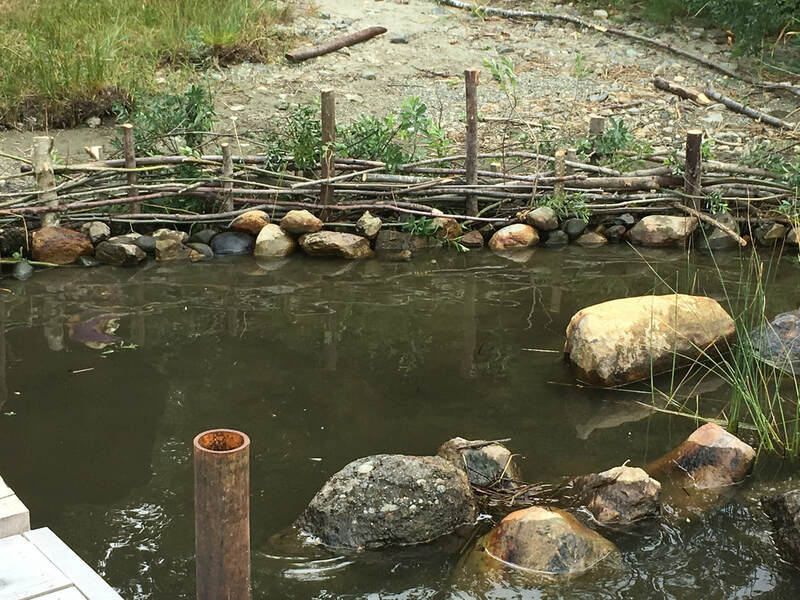 Note: this project was made possible by the Pacific Salmon Foundation and a host of volunteers to whom the SBS remains grateful. Shawnigan Lake Receives $5000 in 2016 from the Aviva Community Funding Program! 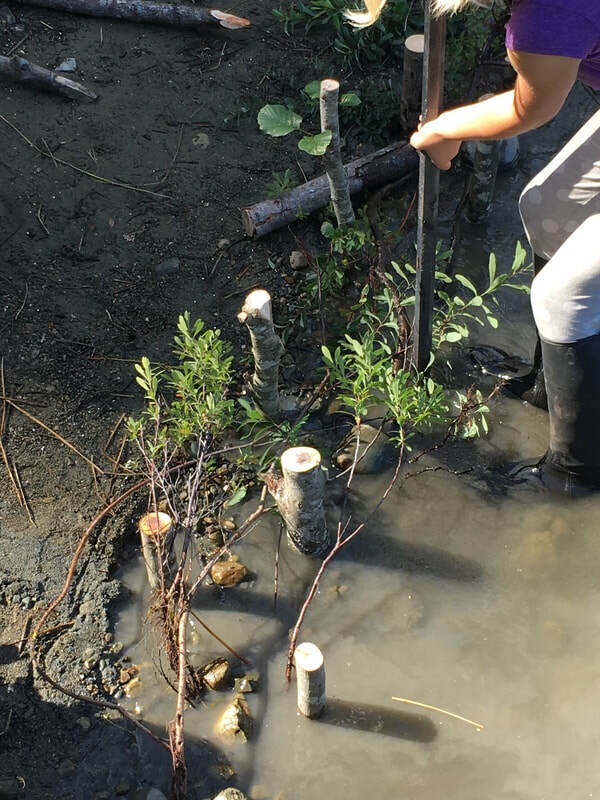 On September 24 and 25, 2016, the Shawnigan Basin Society sponsored a FREE Ecological Restoration Workshop lead by David Polster, a nationally acclaimed ecological restoration expert and our very own Carolyn Dowell, a bioremediation expert. Funds for this weekend were made available by the Aviva Community Grant and kudos to community members and friends are needed as it was their support through online voting that achieved a $5000 award! On Sept. 24, twenty-five Shawnigan Lake residents, including representation from Shawnigan Lake School and Dwight International School as well as a host of foreshore and private property owners who attended the theoretical component of the workshop (including one person from Victoria!) learned the power of assisting nature’s process to aid in restoring ecological integrity. 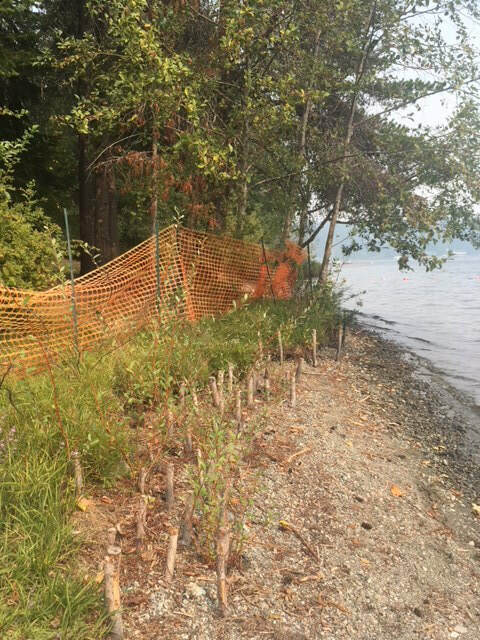 Specifically, they learned how wattle walls and live stakes created from willow branches, a native species, can mitigate foreshore erosion by absorbing and disbursing wave energy caused by motorized recreational activity. 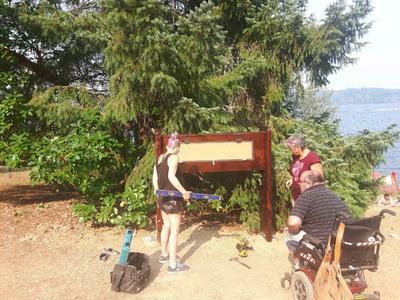 On Sept. 25, sixteen people conducted field work toward the common cause of completing a restoration project at the West Shawnigan Provincial Park. It was a beautiful day to be outdoors and the feeling of community was overwhelming! 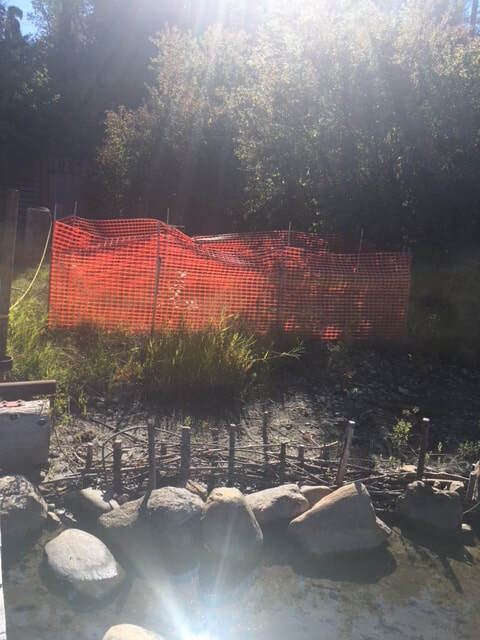 The Basin Society invites you to view this work (which will be fully completed next week with the addition of another fifty feet of snow fencing to keep animals from eating the plant growth) and to consider having your lakeside property assessed for a similar project. Within the coming weeks, we will install an interpretative board on site to explain this initiative, intentionally placed in a high public area yet not encumbering public access. In the coming months, we aim to undertake three additional projects along the Park’s foreshore to demonstrate the power of these simple, one time, and inexpensive techniques. Nature’s resilience will become clear as these restoration projects develop independently yet over a staggered period. 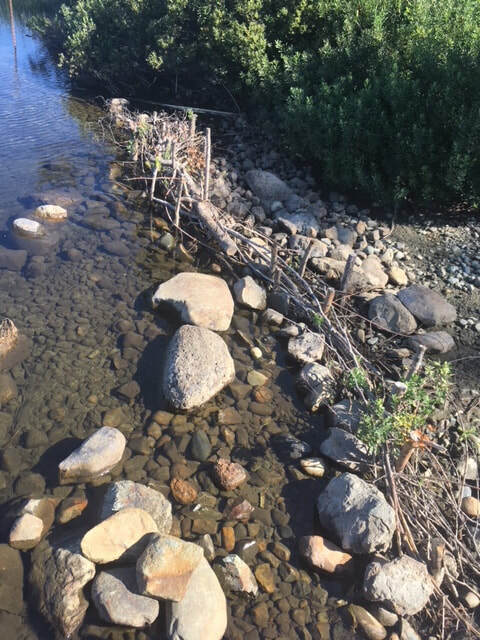 Whereas retaining walls are expensive, negatively impact riparian areas, and resist wave energy (which eventually causes them to be damaged), wattle walls and live stakes slow the flow of water and absorb energy as it makes its way to shore. 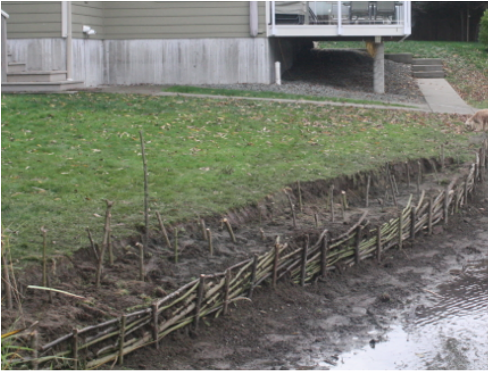 The Basin Society encourages ecologically sound solutions when addressing the problem of foreshore erosion. 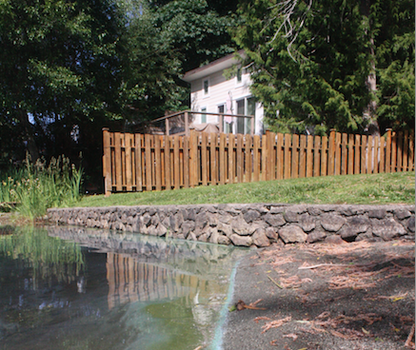 Additionally, following these techniques will act to protect overall ecological integrity at the lake’s edge where root systems clean surface water entering the lake; enhance and protect a healthy plant and aquatic habitat; increase environmental biodiversity; restore ecological services, which function to reduce sediment and nutrient runoff into the water; enhance opportunities for privacy; and aesthetically enhance property value. Lakeside and water solutions become reciprocally possible: from the lake to the shore and conversely, from the shore to the lake at the same time! TOGETHER, we can reduce our ecological footprint with cost effective, environmentally safe, and long-term solutions. 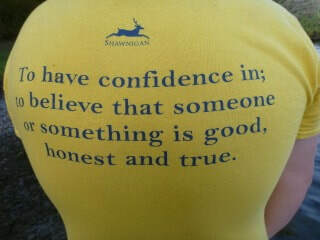 Please, do your part, to help keep Shawnigan Lake clean! Ecological Restoration Project 2 was conducted on September 25, 2016 at the West Shawnigan Provincial Park. "Before" photos above demonstrate the degree of erosion. 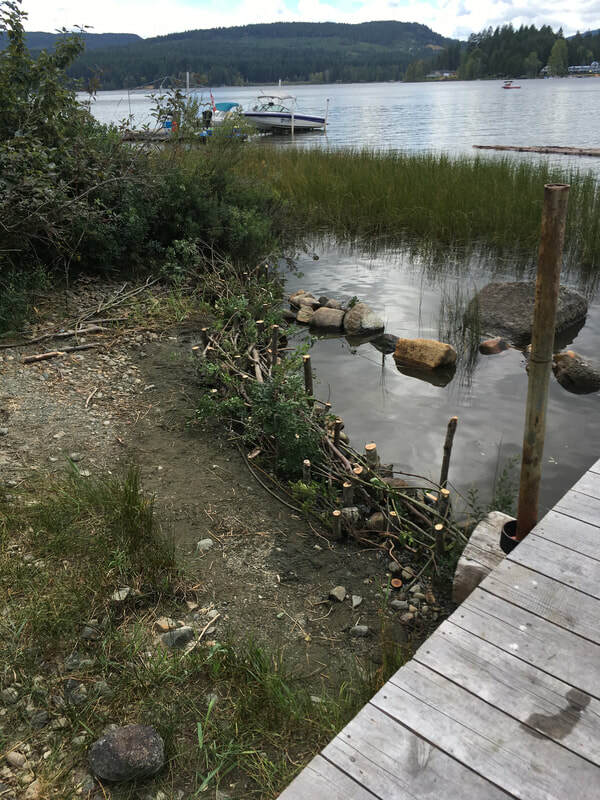 Where foreshore erosion created by wave energy caused root exposure and a disintegrating shoreline, live staking and wattle wall construction were introduced thus mimicking Nature's design and assisting natural systems toward achieving ecological integrity. 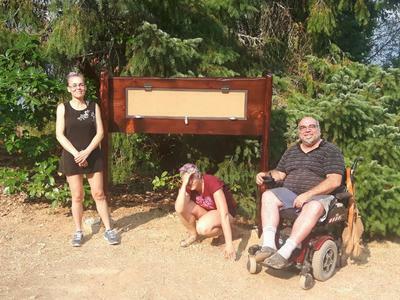 Signage at the Ecological Restoration Site in the West Provincial Park has been installed. HUGE gratitude goes out to all those who contributed! 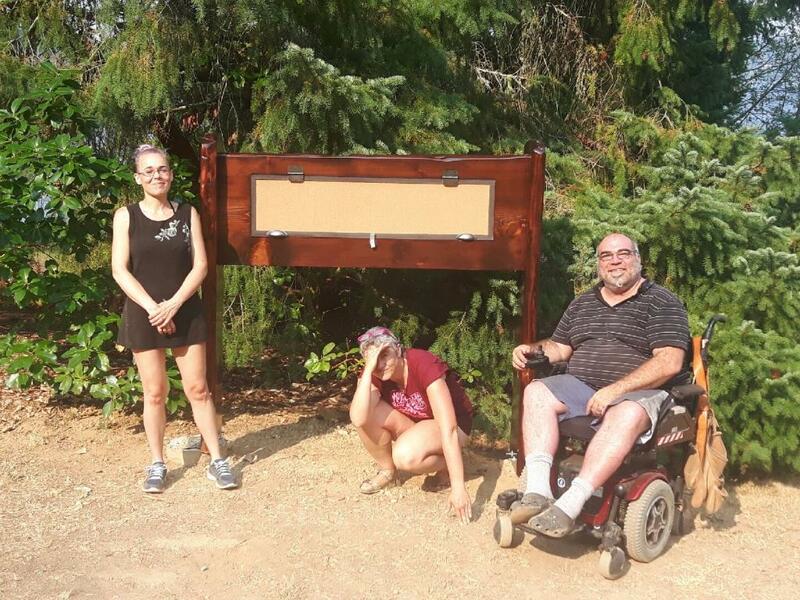 Signage has been created to share our story and has been installed near the first restoration site at the north edge of the West Provincial Park’s foreshore. Intentionally placed in a high public area, the information made available will be updated to demonstrate the success of this model and exemplify how cooperating with Nature benefits us all. Deep gratitude is extended to Troy Lywood, Jacqui Gilbert, and Carol Annett for their skills and dedication in designing and building the sign. 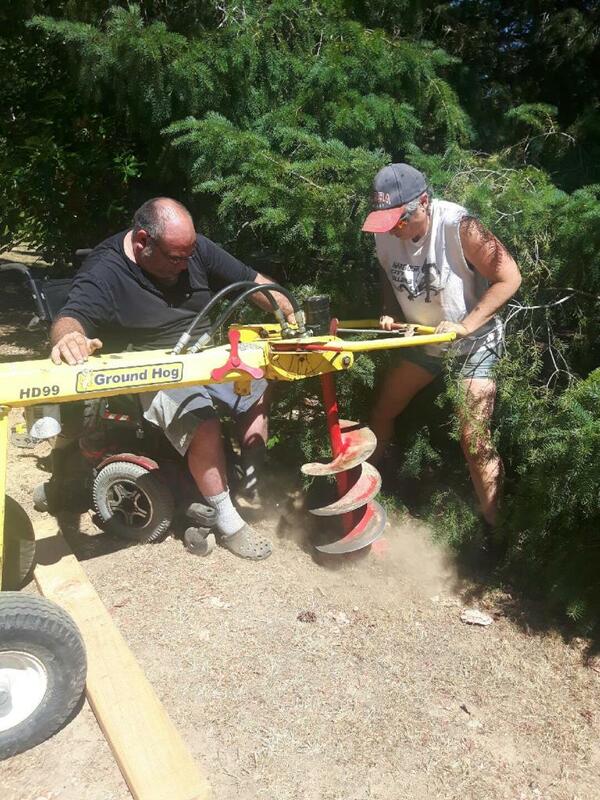 A giant thank you is extended to Bill Savage for donating the wood and to Graham Gidden of the CVRD Parks Department for his help in seeing this project supported! 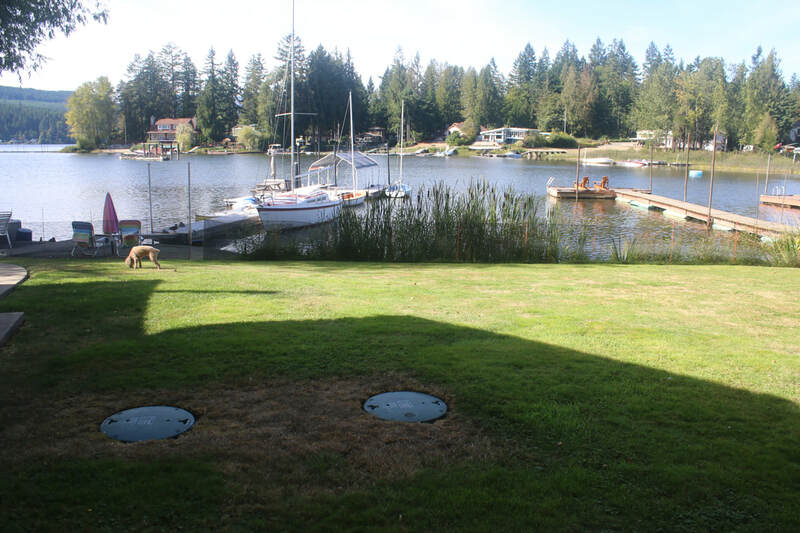 On August 20, 2018 new photographs were taken of this restoration project at Shawnigan's West Provincial Park. 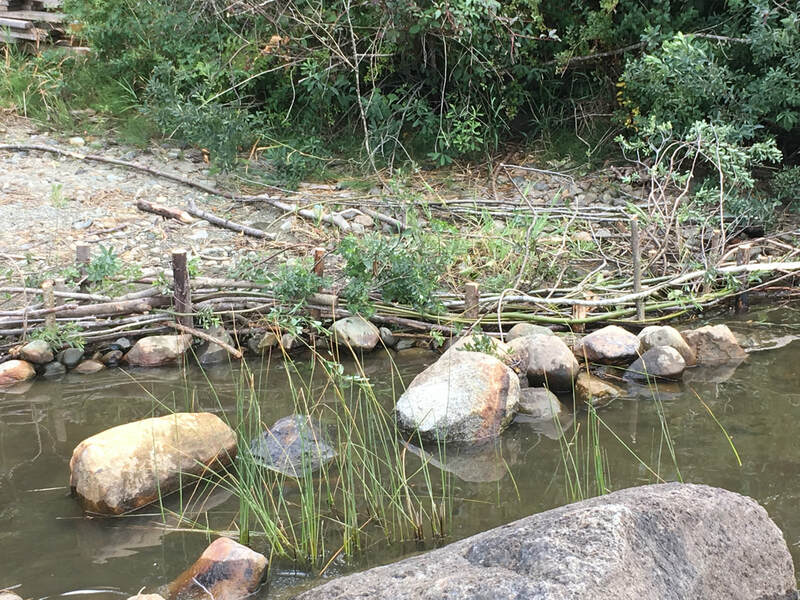 The findings are described as follows: It would appear the first effort, the wattle wall done in late September 2016, brought the valuable knowledge of the importance of location, ground conditions, and water levels when conducting future projects. In short, the wall - a huge body of effort and energy - was unsuccessful as the surrounding area was not conducive to its stability. That said, 11 of the 66 live stakes are showing some growth with new leaves sprouting!!! The SBS believes leaving the “dead” stakes is equally important to the growth we are seeing and ought to be left alone. If nothing else, the stakes are creating ground stability, which eventually will further support the growth as it flourishes and spreads. 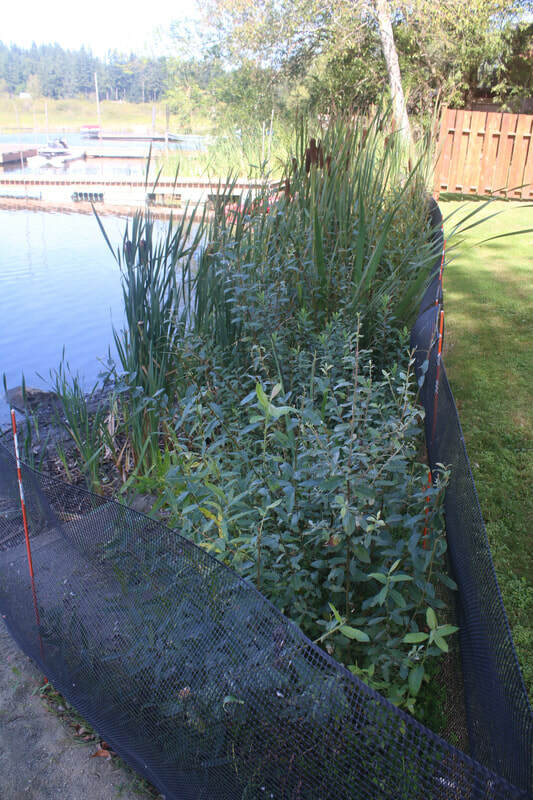 The efforts of planing native species along the upper shoreline in late August 2017 also indicates some success and promising growth as shown in the attached photos. I am excited to observe Nature’s residence in action! Recommendations further to leaving the project "as is” include new snow fencing and new and updated signage for the public to better understand the intent of the project as well as what has transpired over the past two years. This will be done in the following 2-3 weeks. 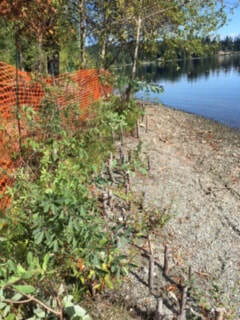 Given the West Shawnigan Park is the third ecological foreshore restoration effort of the SBS, it provides necessary compare and contrast information with the other two projects on the east side of the lake. For example: 1) the influence of wave energy, which is reduced on the west side due to the area being inside a public park versus on private property (from the water to the shoreline) 2) the protection levels (and therefore increased successes) of restoration projects along the shoreline itself given the direct difference in the amount of human impacts experienced at the specific site (from the shoreline itself). Ecological Restoration Project 3 was conducted on August 24, 2017 with thanks to a local resident who volunteered his property. 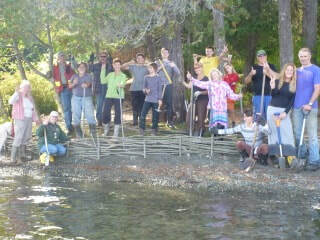 Deep gratitude to the fifteen volunteers who undertook 4 hours of work to achieve our goals! Using Hardhack (Spiraea Douglasii) from the north and south shoreline of this eroding property, live stakes four rows deep were embedded before weaving layers of rooted branches between the stakes. Rocks were then used to hold roots under the water's surface, natural grasses were planted around the area, and finally rocks were placed in front thus creating the final layer of protection. These photos convey growth as of September 5, 2018 on this same property. 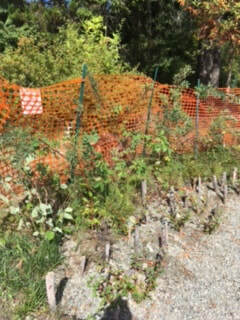 In this case, snow fencing was not immediately installed to surround the new growth. Consequently, deer ate much of the new growth from this Spring. 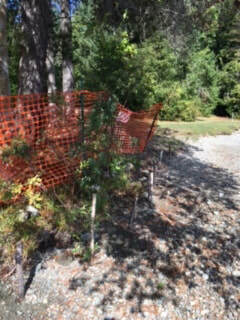 Snow fencing has now been installed, which will prove beneficial in next years' plant growth shown in new photographs. Shawnigan Lake residents are proud of their accomplishments to assume locally driven ecological control of our watershed and of the stewardship we are championing. With a complete baseline of technical research nearing fruition and valued at $90,000, we have additionally been the recipients of equal valued in-kind donations! Our momentum has been established, yet it is important to continue opportunities for citizens to show their support toward our holistic endeavour. People ought to vote for our idea, as financial backing will ultimately result in the protection of people and property from increasingly volatile weather; protect the diversity of nature and quality of life; promote watershed integrity and sustainability in a growing community; and minimize environmental impacts and restore natural ecosystems. ​variety of provincial agencies, environmental experts, TimberWest and Island Timberlands, First Nations, local groups, and many individual residents. Local taxpayers approved an annual levy of $50,000 for the SBS, beginning in 2014. 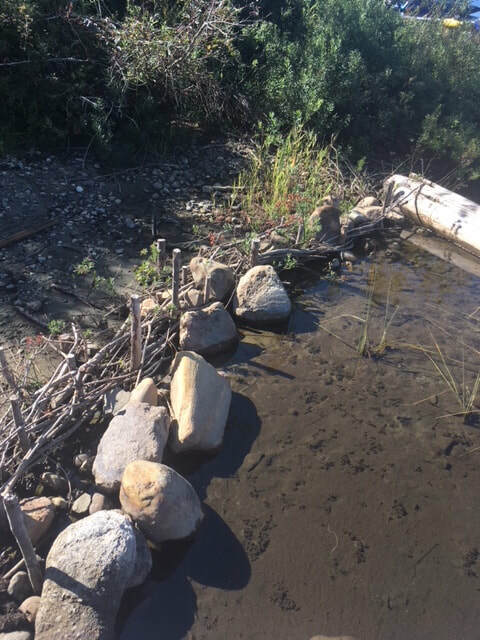 Direct financial support for a basin level effort toward watershed management is evidence of the willingness of the community to “put up the first dollar” and as leverage for other external sources of funding. The Society believes its goal and objectives are progressive and in alignment with the philosophies of our citizens who rely on Shawnigan Lake – our heart – for its ecological services, environmental integrity, and contributing economic health. Using Sooke Lake as our measure, method, and model (as seen on the Home page Google Earth Video), Shawnigan Lake is determined to succeed in restoring our watershed to similar integrity. This work is being done on many levels and largely by a body of volunteers. From "Foreshore to Forest", we are committed to securing our long-term water supply and to building local resiliency.